November 5 — In all of the United States, there has never been a tribute to the hundreds of courageous American servicemen and servicewomen of Dominican heritage who fought for the freedom of their country and the world during World War II. 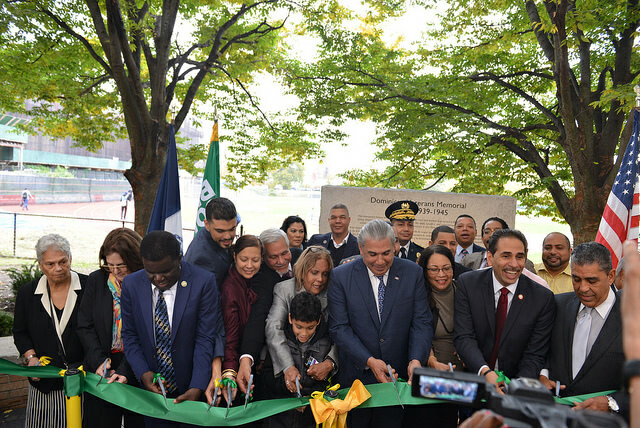 On Friday, November 2, on the campus of Bronx Community College, the ribbon was cut on the nation’s first “World War II Dominican Veterans Monument.” Beneath a thick canopy of clouds, leaders from the Bronx and the Dominican Republic hailed the new addition to the New York City landscape and the 351 heroes whose names are carved into its façade. Other speakers included U.S. Representative Adriano Espaillat, New York State Assembly Member Victor M. Pichardo and a delegation of ten Dominican and Dominican-American leaders, led by Carlos Castillo, Consul General of the Dominican Consulate in New York. Following the dedication, a reception was held at BCC’s Roscoe Brown Student Center, where guests were serenaded by a Bachata band and enjoyed Dominican delicacies and fond memories of those whose names are now immortalized in marble. For further information, contact david.levers@bcc.cuny.edu or 718.289.5157.